Here at Cyclone24, we very much like to encourage all those who brave the boards to undertake some fundraising and over the past three years we’ve seen some fantastic amounts raised for various local charities. This year, however, a team of 12 from Willmott Dixon, really went the extra mile and raised a superb sum for their charity of choice, Prostate Cymru. Prostate Cymru, is the leading charity in Wales working with medical and nursing professionals in the fight against all prostate diseases, especially benign prostate disease. They are dedicated to fighting prostate cancer, procuring equipment and raising awareness in the Welsh Principality. Throughout the UK Prostate Cancer kills 12,000 men every year with over 32,000 new cases diagnosed. The two Willmott Dixon teams – made up of Julian Morgan, Charlie Evans, Kayleigh Lee, David McCarthy, Ryan Williams, Paul Andrew, Ed Wilson, Simon Williams, Nigel Talbot, Darren Gravell, Paul Wyatt and MD, Neal Stephens – took part in our 24 hour challenge at the Wales National Velodrome this October and between them raised an amazing £6,922.00. A truly incredible team effort! 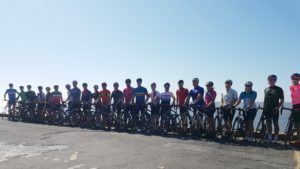 A massive well done to both Willmot Dixon teams for not only the awesome fundraising, but for the fantastic cycling effort too! Now to start training for next years challenge? Keep an eye out for our January Rider Interviews as we hear more from Julian Morgan and Kayleigh Lee on taking part in the challenge.